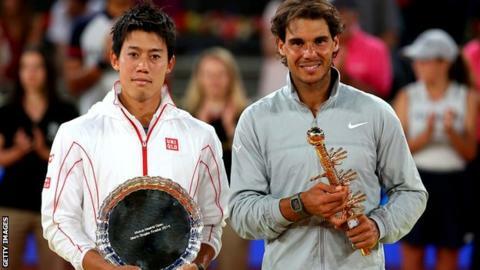 Rafael Nadal won his first title of the European clay-court season as a back injury forced Japan's Kei Nishikori to retire during the final in Madrid. The world number one led 2-6 6-4 3-0 when a hobbling Nishikori, who had led by a set and a break, pulled out. The Spaniard had lost in the quarter-finals of his previous two tournaments, in Monte Carlo and Barcelona. He will now head to next week's Rome Masters before moving on to Paris at the end of the month for the French Open, where he is an eight-time champion. Nadal had sympathy for Nishikori, saying: "I'm sorry for him. When you suffer something like that, it's really tough. "I suffered a similar situation in Australia this year. So I know what I'm talking about and how bitter it is, especially when you're playing an important match." Nishikori, 24, went close to causing a major upset in Madrid, only to injure his back during a service game at 4-3 in the second set. He had required several bouts of treatment during Saturday's but this time the trainer was unable to get the Japanese player back to a competitive state. Nadal, roared on by his home crowd, had been fighting hard to get back into the match after an edgy start under pressure from Nishikori's attacking game. When the 13-time Grand Slam champion failed to convert four break points from 0-40 early in the second set, he looked on course to lose a third match on clay for the first time since 2004. But it was a trademark heavy forehand from Nadal that saw Nishikori pull up as he was forced to change direction in game eight, and from that moment the 10th seed was effectively unable to compete. "I am very disappointed about what happened in this final," said Nishikori. "Unfortunately, I was hurting already and I tried to fight but Rafa was too good today, so congratulations to him."